This notification is only for a post that I originally wrote, which has been edited by someone else. "Topic title / Username has edited your comment on Talk:Boardname". The notification links to the Topic page, with the edited comment highlighted with a colored bar on the left. This is a prereq for allowing people to edit other people's posts. 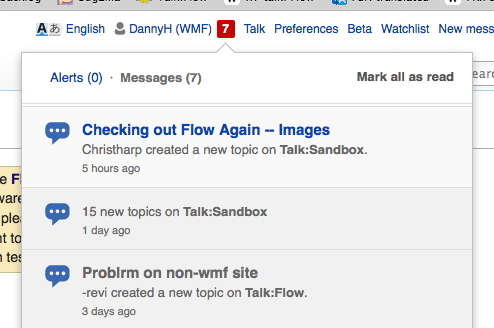 DannyH added projects: Collaboration-Team-Triage, StructuredDiscussions, Notifications. DannyH edited projects, added Collaboration-Team-Sprint-R-2015-03-11; removed Collaboration-Team-Triage. • Mattflaschen-WMF claimed this task. There was already a notification for it. However, I changed it to meet these requirements. I kept the term 'post', instead of 'comment', for consistency with the other notifications.